Attending the United Motorcoach Association (UMA) EXPO in 2013 proved to be extremely fortuitous for the three owners of Brookfield, CT, tour bus operator Coach Tours. Ira Steinberg, Michael Neustadt and Kelli Simmons’ growing company had been managing reservations and tour quotes by handwritten bookkeeping and were searching for a solution to streamline that process. At the time, Coach Tours managed reservations in a notebook – recording one day’s worth of client reservations per page. After implementing busHive, Coach Tours saw an immediate improvements in its charter quoting. Walking the floor at the conference, the trio of owners met Brian Mann, director of sales at busHive Software, who described the exact system they were looking for – an all-in-one quoting, scheduling, itinerary, invoicing and financial reporting program tailored specifically for motorcoach operators. “Though the owners met with a few other companies, busHive was the most willing to work with what we were looking for, and the software promised to be very user-friendly,” Dwyer says. 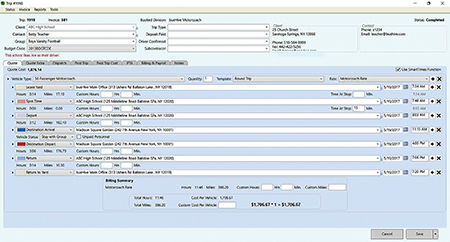 busHive’s PC Miler Integration automatically calculates time and mileage for charter quoting. years later and today the company’s fleet stands at 20 deluxe motorcoaches. The company serves New York and Connecticut clientele, delivering motorcoach rentals with services to 48 states and Canada. At the time of the owners’ initial meeting with busHive, Coach Tours was running 22 motorcoaches – a situation which made the need for busHive’s services even more immediate. 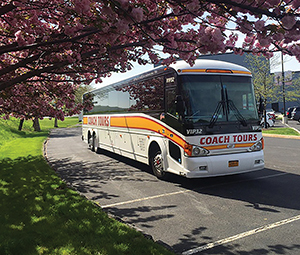 Coach Tours currently operates 20 motorcoaches out of Brookfield, CT.
busHive, which began as Easybus in 1997, aims to streamline workflows and recordkeeping across the entire charter process – from the initial quote, to confirmations and contracts, generating driver itineraries, billing and invoicing. Once a customer books a charter, busHive automatically generates confirmations for the operator. 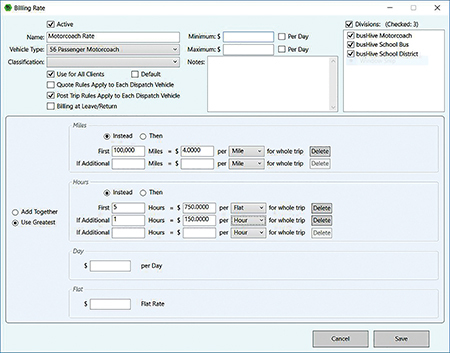 The software customizes contracts’ unique policies, terms and conditions, specifically for Coach Tours. 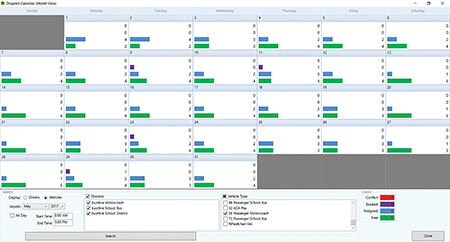 The system has a built in, fully-integrated dispatching and scheduling estimate, color coded by vehicle. With the click of a button, Coach Tours staff can view a calendar and quickly see what equipment they have available each day. This prevents overbooking, and allows the operator to easily adjust rates for high-demand days. busHive’s support team integrated its software at the Coach Tours operation using its traditional four-step implementation process: installation, data import, configuration and training. The first step – simply enough – involved workstation-by-workstation installations of the busHive software. busHive’s dispatch calendar easily displays vehicle & driver availability. Next, busHive gathered Coach Tours’ work requirements and imported the operation’s local data into the system – customer names, phone numbers, addresses and emails; as well as vehicle and driver information. busHive’s configuration phase involves customizing the program to suit Coach Tours. Support staff imports personalized quotes and confirmations, invoices, billing rates and preferred dispatch display information into the system, tailored specifically to Coach Tours. Finally, busHive handles training based on responsibility. Most training was handled over the phone and web, but busHive can conduct on-site training as necessary. For example, Coach Tours differentiates pricing structures for single day and overnight trips. Because of this, the system didn’t originally know that a two-day trip merited a different minimum price – resulting in quotes that were much lower than they should be. Dwyer says that busHive was proactive about correcting the issue and customizing the system to fit Coach Tours’ pricing. Mann describes the average implementation as a 30 to 90-day time-frame depending on whether custom development and reporting is required. Dwyer believes Coach Tours’ reservations, quotes and dispatch and dispatch saw immediate benefits from the busHive system. No longer handling quotes and booking by hand, the system allows the dispatch department to automatically generate most items. Furthermore, because Coach Tours’ three owners are very involved in the company’s day-to-day operations, Dwyer says the new motorcoach and charter management system has greatly freed up their time. Coach Tours’ improved system means much more responsiveness to customer needs. Whereas staff previously had to run trip modifications through the dated MS-DOS operating system, then print and mail the new quotes and schedules on a periodic basis. Now, Coach Tours sales staff can change a trip within seconds, then instantly send new information to a customer for review and feedback.